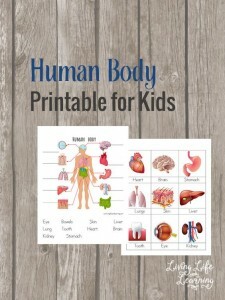 You are here: Home / Free Printables / The Amazing List of FREE Human Body Resources! 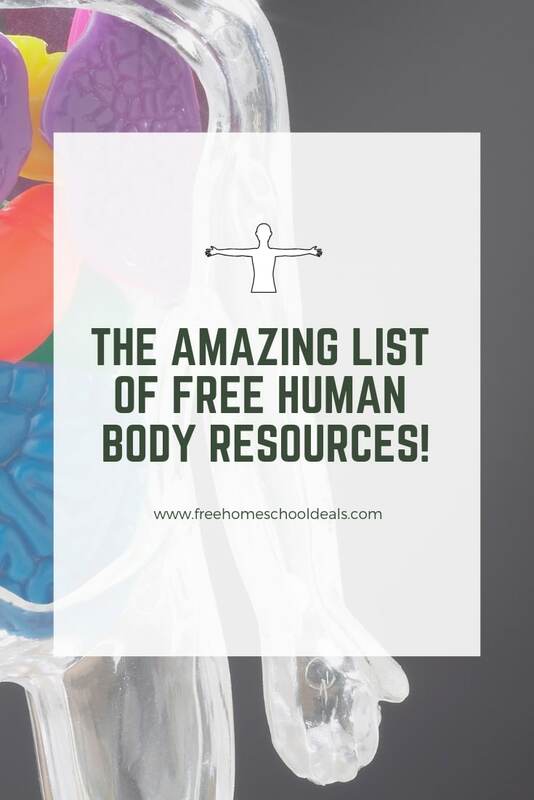 The Amazing List of FREE Human Body Resources! 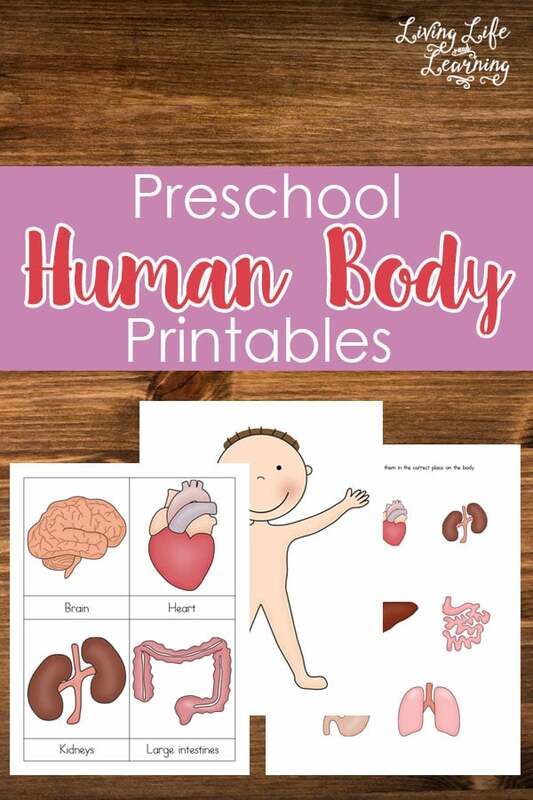 Learning about the human body is an essential part of our education, and it can be started in preschool and continue into the rest of our lives. It’s an important subject, but it is difficult to teach if you don’t have the right materials or ideas to work with. Lucky for you, we here at Free Homeschool Deals have compiled a list of our excellent (and FREE!) human body resources for you to check out! They range from preschool to elementary and upper-level grades, and there are so many opportunities for creativity and fun within these resources! Also included are ideas for uses of these materials in literacy and science to inspire you to implement cross-curricular instruction in your homeschool, providing a more balanced approach. Enjoy the discovery! If you’re looking for a multi-pack of resources, this is for you! Included are 3-part cards, 2 pages of male and female anatomy with vocab, and a page of organs all for preschoolers. 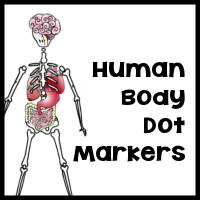 Dot Marker pages can be used for preschoolers beginning to learn about the human body. It engages their body as well as their mind which helps them to focus, and they will develop their fine motor skills. 5 organs are included. Perfect for penmanship and handwriting practice, this is a pack of 65 pages full of anatomical images and human body vocabulary. It’s useful for both literacy and science! This is a great resource to use over and over again. When learning about organs, use these 2 and 3-part puzzles to practice organ names and their location in the body! This is an amazing two for one resource! 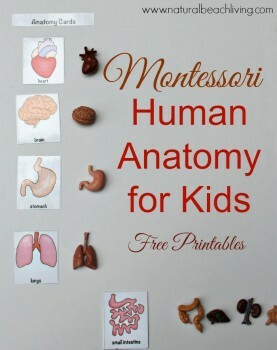 With this reader, your child can learn anatomy vocab and the use of different body organs and can use it as a reading book. This pack is great for elementary age students, and even the upper-level elementary students can use it too. 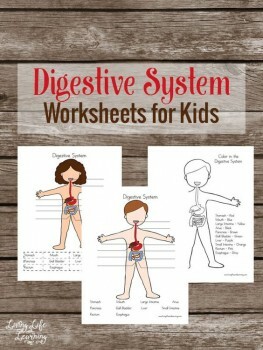 These worksheets are all about human digestion, and you can choose whether you want to use a male or female page. There is cutting and pasting, labeling, and coloring. 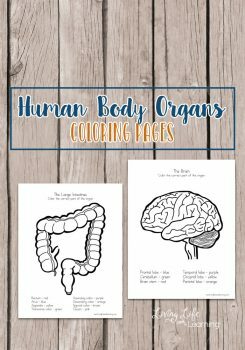 It’s a great addition to a science lesson about the organs and a good extension activity after learning the vocab for human digestion. This is a resource you can use however you like. You can use it in science to practice the systems of the human body and do research or create projects. You could also use these in literacy as a vocab lesson and practice writing sentences with them. 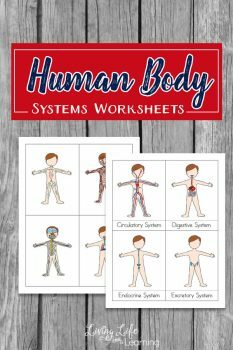 Human Body Resources–Printables, Activities, & more! 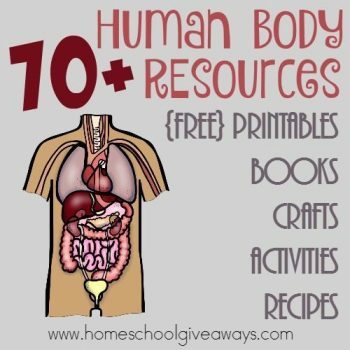 This is another compiled list of 70+ resources all about the human body. They range from games to flashcards to vocab work and more! You won’t be at a loss for inspiration and ideas with this post! 3-part cards are perfect for vocab learning or matching or memory games! 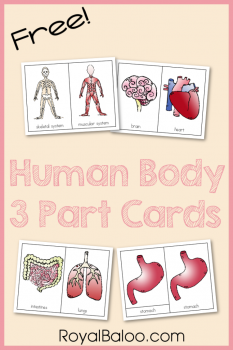 These are beautiful cards that show body systems and organs. 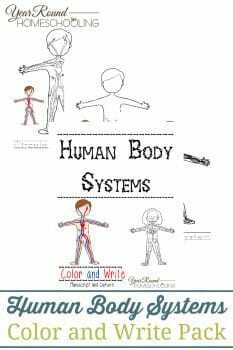 Thanks to Kimberly at Natural Beach Living, there is an amazing list of human body lessons, materials, and ideas for your homeschool! There are amazing links to purchase materials to add to your lessons. Ideas and materials include miniature body organs, human body printables, a lifesize body floor puzzle, and more! 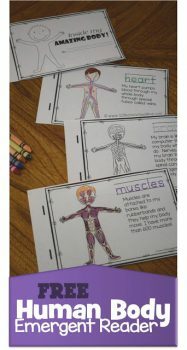 This resource includes a worksheet with body labeling and a worksheet of cards. It is a good resource to use for an intro to studying the human body or as a short post-quiz to a lesson. 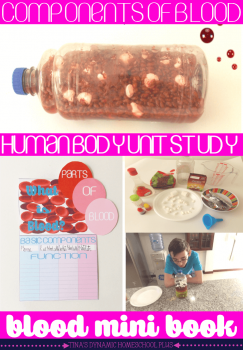 If you want to zero in on a particular aspect of the human body, check out this unit study all about blood. There is a lesson idea for how to make blood as well as other resources all about blood and its purpose in the body! Click here for more resources from Free Homeschool Deals!